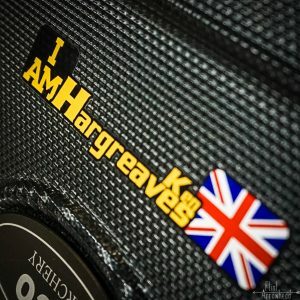 A couple of weeks ago I had the opportunity to shoot with Ken Hargreaves, an ex-army serviceman who has just returned from the Invictus games. 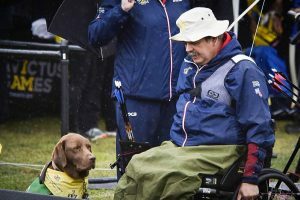 The Invictus Games were conceived by Prince Harry in 2013 after seeing the impact that sport could have on the wellbeing of injured, wounded or sick services personnel. They allow the unconquered men and women who have made great sacrifices for their countries, to demonstrate their tenacity once again. Ken is a straight-talking, down to earth squaddie who joined the army as a boy in the 70’s, and worked through the ranks, only to be wounded in Iraq in 2003. 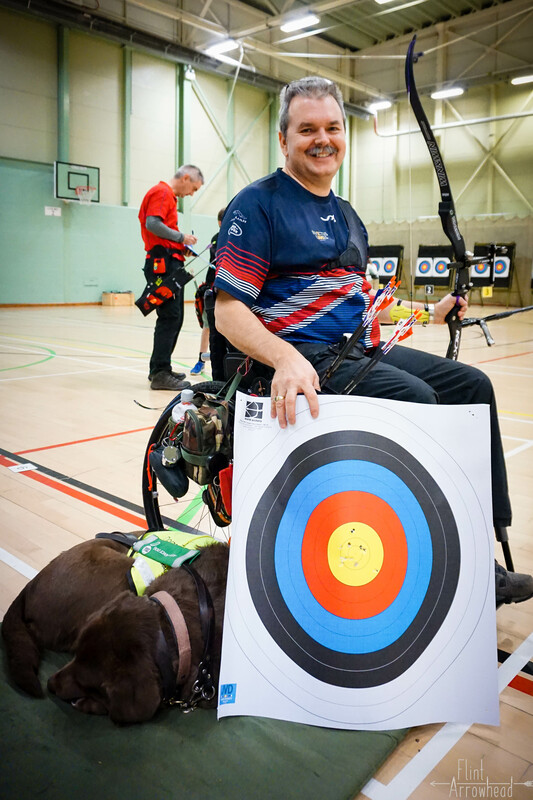 After a medical retirement from the Army in 2006, he spent time in recovery at home with his faithful assistance dog Fred, before discovering archery last year. Of course, it hooked him, and since then he has competed all over, including representing GB at the Invictus Games 2017 in Toronto. 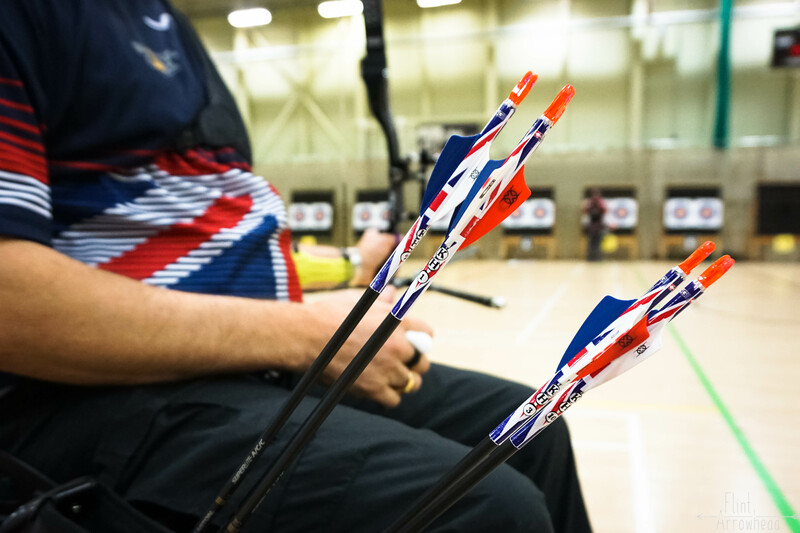 What inspired you to take up archery? My niece and Jenny, my wife, decided to take up the sport after a taster session at a local fair. When I went to the local archery shop for their kit, the guys at the store told me to try it out! So I did, happened to be reasonably competent, and thought oh, maybe I should give this a go! I’ve shot (rifles) since being knee-high. All my time in the forces I was a marksman, no matter what job I did. 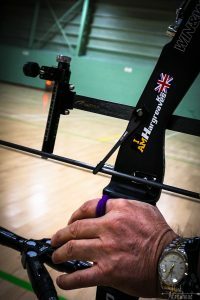 So those skills you have transpose into archery very easily, simply and efficiently. Eventually I saved up money for my own kit, joined a club, and the rest is history. What do you like about the sport? I enjoy getting out and meeting people again. I live in the middle of Northumberland and you’re surrounded by sheep and cattle! Although I wouldn’t have said I was becoming a recluse, my wife would say I needed to get out and socialise.  Archery is not just about getting onto the shooting line, it’s about all the other social aspects that go on with it. How do you modify your technique to get the best results? When you’re in the chair, it’s harder to shoot. You’re acting uphill. So you learn to cope with what you have, and utilise to the best ability your physical capabilities. I try to keep my technique as near to perfect as possible. The closer to perfect it is, the less strain on my back and body. Then I don’t have to muscle it through. It can be your own style, but the technique need to be as near as possible to perfect. I have a T1 and lower Spinal injuries, so when I get tremors I need to come down, reset, and start again- if I have time! I also try shoot kit that suits me the most. Light bow, light limbs. My kit gives me confidence. 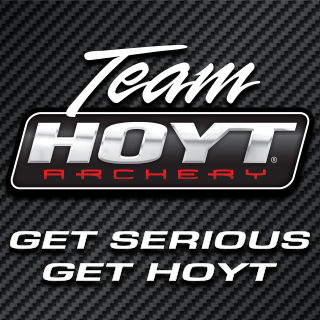 What bow are you using at the moment? It’s no good me shooting a heavy bow- I need a light bow and light limbs, that’s what suits me most. I use the W&W RCX-100 with 66”, 36# limbs. There’s a limit to what poundage you can pull in a chair, but I would like to try some longer limbs next to get a smoother draw cycle, but it’s affording it at the moment- archery is an expensive hobby! When we landed and we got through the doors, I’ve never seen crowds like it. People that I didn’t know had flown out from Britain to support us all, it was amazing. It was touching, and I got a lump in my throat! The press were there, people were cheering and congratulating us and I just thought well, I’ve just done my job. We don’t need congratulations for that! The people of Toronto did it proud. They went out of their way to be helpful and generous. The Canadian legion 388 in Toronto hired an electric wheelchair for me! It meant I could go out shopping with my wife for the first time in ages. Also, an expat found out that I was struggling to find Fred his dog food, so he left a bag of food at the hotel for him! That’s an example of what people were like. Small courtesies that meant the world. So the Games- how was the competition? I shot as a novice, which meant I was only allowed to use beginners kit provided. This was intended to give all the archers a level playing field but unfortunately for me, being used to my own equipment, it didn’t show an accurate depiction of my skills. It was a 60 arrow ranking round on a 60cm face followed by seeded Head to Heads. I finished 2nd in qualifying which I was pretty chuffed with, even with a malfunction half way through with my bow sight. When I came back from Toronto I needed to prove something to myself, so I got myself into the Interservice Army Indoor Individual Championships, a FITA 18 shoot for forces personnel. There were people from all forces there, as well as previous Invictus Games winners. I made a point of going, and I made a point of winning. I had unsettled business, and I went there to win. To prove a point to not only myself, but everyone else. It was fantastic and made the feeling becoming individual champion that much sweeter. How did you maintain that winning mindset throughout a shoot? The military discipline I had been taught and the marksmanship skills I already have, help. What was your favourite moment at the Games? Being able to see my wife’s face when I was in the opening and closing ceremonies. I could see the face that I had always seen before. She looked at me with such pride. She always shows and tells me how proud she is but there was just this extra bit to it! What did the games mean to you? I think the crux of the Games is bringing you back into a military fold. It’s not necessarily about the sport you compete in, and it’s definitely not about winning the medals. It’s about having the camaraderie that was once there back when you were in the services. It’s about being able to finish as a team. That’s what Invictus does. It takes you from that place, when you’re sat at home feeling miserable, to being back out there with a team, with people you can associate with. Do you have a favourite archer? I admire my coach, Helen George. She has done a vast amount for archery, para or otherwise. She is such a vehement supporter of all archers, and never once requires or requests anything in return. I also admire Maggie Squires, coming back to archery after a long break. 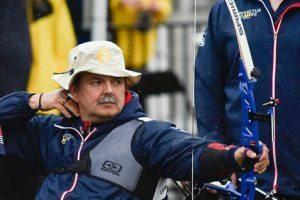 It’s fantastic that Great Britain have another archer coming back to shoot and enjoy themselves again. What are your goals from now on? I want to improve my skills so that I only stick my arrows in the gold. And we will see where that takes us. The Paralympics would be one of the greatest honours. To think I could attain the skills to even become part of the team, to have to potential to go to 2020 or beyond, is incredible, because I’m not 24 anymore! At 56 years old I’m not doing too bad! Age isn’t a bar for me. 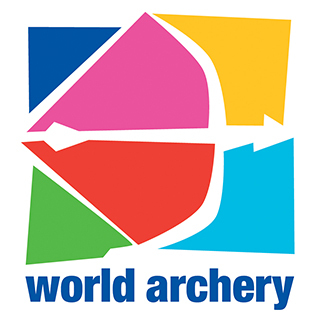 As long as you have got some teeth in your head, or one arm or one leg, you can do archery!